Since the 2008 recession, challenging financial times have led multiple industries to face chronic shortages in resources and personnel, creating the need for organizations to increase staff productivity with limited resources. Olmsted County has already made impressive progress adapting to lean fiscal climates. In 2011, it began implementing Kaizen — a Japanese planning approach meaning “to take apart and put back together better”— along with plans to automate and minimize steps in its business processes. Q. Why did Olmsted County adopt the Kaizen model for process planning? Was there an organizational challenge that led you to this methodology? A. Budgetary constraints have necessitated new ways to provide services to county residents, and the Kaizen approach gives us solid footing for doing more with less and leveraging existing resources with technology. One of the first processes we looked at was employee expense reimbursements in our finance department. The Kaizen approach led to redesigning that process to create e-reimbursements. Rather than employees taking the time to fill out and mail paperwork to finance, they now submit a form online and attach a scanned copy of the receipts. The improved process has resulted in a 70% decrease in reimbursement processing time from an average of up to three weeks per reimbursement to one week or less. Q. Can you provide an example of a department that has used the Kaizen approach to improve processes? What have been the results thus far? A. The work we have done with the Housing Redevelopment Authority (HRA) focuses on the low income public housing turnover process, which occurs when an individual or family moves out of a county-owned property. In this scenario, the HRA staff must perform inspections, maintenance or updates; complete an application process; and obtain approval to get a new tenant into the unit. For instance, one beneficial change has been to keep a pre-approved lease applicant list rather than beginning the tenant search once a unit becomes available. As a result of our efforts, the average turnover time decreased from 84 days to 14, meaning an eligible person or family may obtain housing 70 days sooner than before. Q. Keeping in mind that the implementation is not yet complete, what have been the benefits of this initiative to date? Are there any early ROI numbers or insights you’d like to share? A. While the initiative’s implementation is still in its early stages, the county has already seen outstanding results. Since launching the program, our process improvements and implementation of Laserfiche have produced a total hard savings of $2.8 million and a total medium savings (the estimated value of process efficiencies) of $1.4 million. In addition, the initiative’s productivity gains have generated a combined savings of $2.6 million in federal and state expenditures. 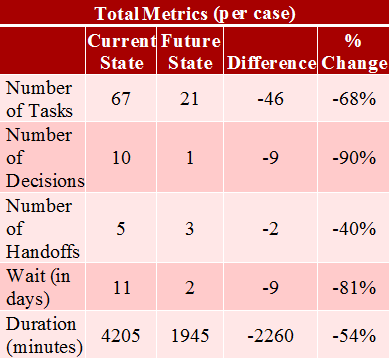 The above table demonstrates the results of Olmsted County’s process improvements in terms of reduced tasks, decisions, hand offs and time spent. As for my insights about our efforts thus far, Olmsted County has invested in the resources and technology to do something amazing, and we’ve only begun to realize the future potential of the initiative. Hear more from Rob Ronnenberg and other knowledgeable attendees at Empower 2015! 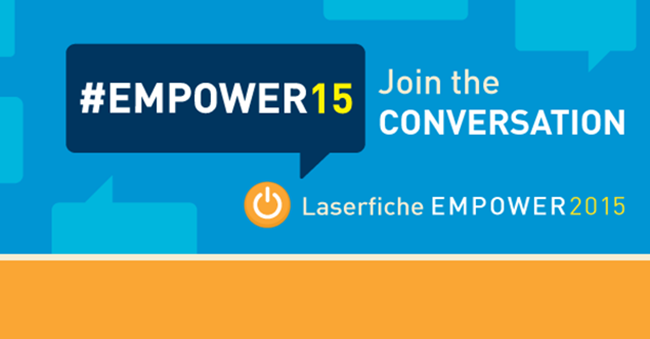 Follow our hashtag #Empower15 to get real time updates and join the conversation.